One of the most important steps in setting up a WordPress site/blog is choosing the correct theme. WordPress themes are templates that change the physical layout and look of your site. They can be used to make your site more appealing and easier to navigate, more professional or more centered on blogging and discussion. There are hundreds of themes out there, and Bridgewater offers a lot of options for you to choose from. To get started, go to your dashboard, navigate to the Appearance Tab and select Themes. From here you can scroll through the different themes you can use. To see what a theme would look like with your site, click on a theme you like and select Live Preview at the bottom of the popup window. After selecting Live Preview, you will be taken to the theme editing screen. You will see a snapshot of what your site will look like with the currently selected theme. If you like the theme you selected, you can press Save & Activate to make this your live theme. If not you can press the big x in the top left corner to return to the themes menu. Quick Tips: All themes are different! Some themes are responsive, while others are not. If a theme is responsive, that means that if the size of the window or screen changes, the page’s layout may change to fit the screen. In other words, what you see on your phone might look a little different than what you see on your laptop. Experiment with different themes to find the one that works best for you. For this tutorial, we’re going to select the Flat theme, click Save & Activate and go to our site view. This is now the main page that users will see when they go to our site. Even though you have a theme selected, you can still alter the way it looks. To do this, select Customize at the top of the screen. 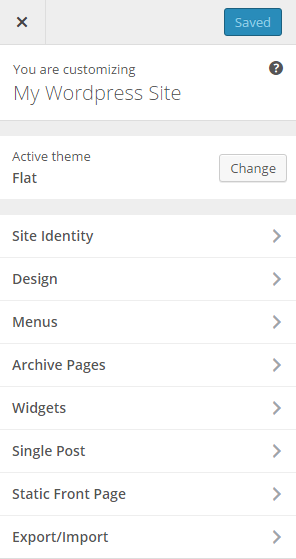 You can change the site’s main title and sub-text from within the Site Identity option for the Flat theme. This is different for every theme. Sometimes it may be called general settings or something similar. You will have to explore each theme to see where different settings are. Design lets you change the colors and background image of the site, making it very easy to change the way you want your site to look! Menus allow you to customize the navigation of the site. If you add “Pages” on the main WordPress dashboard, you will be able to create new web pages for your site. We will go over how to do this later in the tutorial. Static Front Page will let you transform your home page of the site into a normal web page and not a blog feed! Most WordPress site themes default the main page to show blog “Posts”. You may want a normal home page that always shows the same content. You can do this by changing your site to a static page. These are just some of the options you have to customize your site. Remember all themes are different. If you explore the options each theme offers, you can create a site that is as personal or generic as you desire! So have fun and play around with each theme’s customization possibilities. For this tutorial, I’m first going to change the title of our site, the sub-text under the title, and the font. 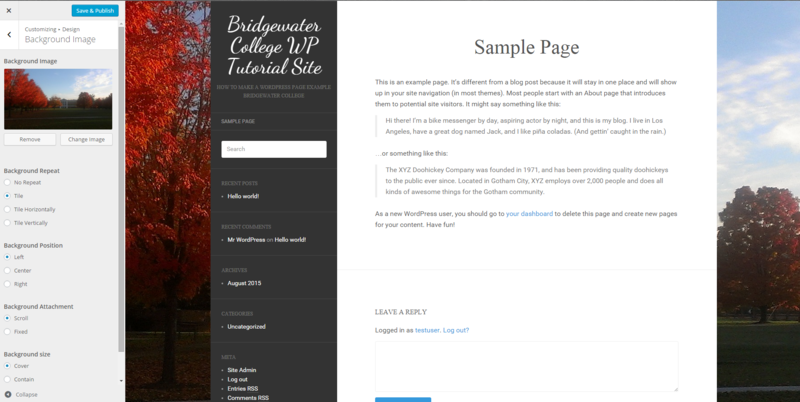 The title I made is Bridgewater College WP Tutorial Site. The sub-text I changed to How to make a WordPress Page Example Bridgewater College, and I chose the font Dancing Script. As you can see, these changes have already drastically altered the look of our site, and we only modified three fields. Next, I want to make my home page a static page, rather than show blog posts. To do this, I’ll navigate to the Static Front Page option and change the selection to A static page, and select Sample Page from the drop down box (we will change this later). You can see we no longer have the “Hello World” blog post showing, but instead a page of static text. Now that we have our site title and main page set, let’s choose a background for the whole site. This can either be a static color, a gradient color (which is preset with this theme) or an image of our choosing. It is really up to your own design preference. For our tutorial site, I’m going to choose an image of Bridgewater College. To do this, I’ll navigate to design => background image and upload an image from my hard drive. As you can see from the image below, I chose a picture I had taken of the school last year. You can upload any image, up to about 1MB in size. If you are not sure how big that is, that’s generally an HD quality image (1920×1080 pixels). Now we’ve set up the basics for our theme! It is amazing how powerful a tool like WordPress can really be, and your own creativity is the only limit. The next step is adding content to our site.